The story of when I was given my first BMX bike. Then asking myself—is there another way to ride it? 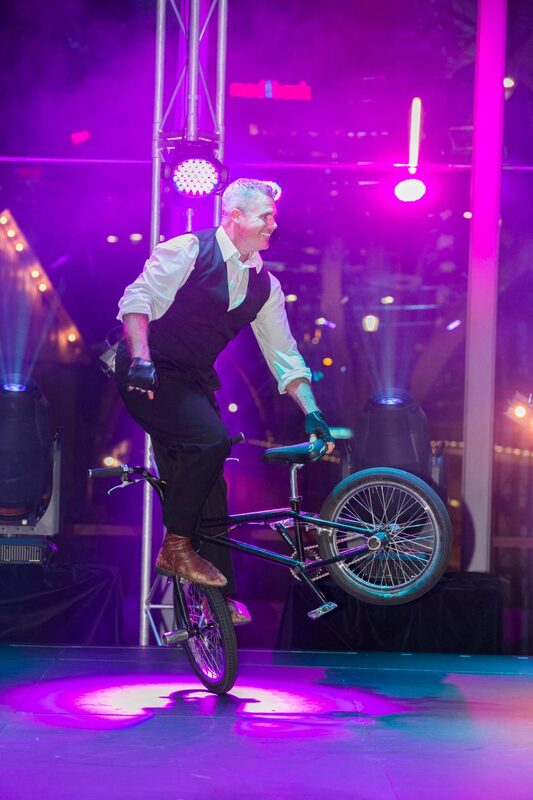 What follows is how I then joined Circus Oz and toured the world doing BMX tricks on stage. The show culminates with the audience helping me to achieve the finale trick. Six people on the bike at once. Incredible! Scott started doing tricks on his BMX when he was 14. After finishing high school, he completed a Degree in Computing Science and a Graduate Diploma in Education. Two years of teaching Maths and Computing Studies was enough to convince him that the performing arts was where he needed to be. Spending 2 years with Spaghetti Circus, Scott studied at NICA for 12 months. He was hand picked by Circus Oz the following year to perform his BMX tricks on stage. He has worked closely with Circus Oz, as well as other smaller companies since 2002. Currently Scott spends his time working freelance, part-time at the aquarium, and teaching circus and acro. This balance allows him to tour less and spend quality time with his family.